The success of Stirling’s Digital District took centre stage today (Mar 21) during a visit from the Cabinet Secretary for Transport, Infrastructure and Connectivity. Michael Matheson MSP took a tour of the City’s CodeBase unit in the Municipal Buildings and met with both the Council Leader, Cllr Scott Farmer, and newly appointed Stirling Council Chief Executive, Carol Beattie. CodeBase CEO Stephen Coleman, manager Adam Alton, and Stirling Council’s Senior Manager for Economic Development, Culture and Tourism, Stuart Oliver, helped walk the Minister through the history of Stirling’s Digital District, and the positive impact it has had on local business. 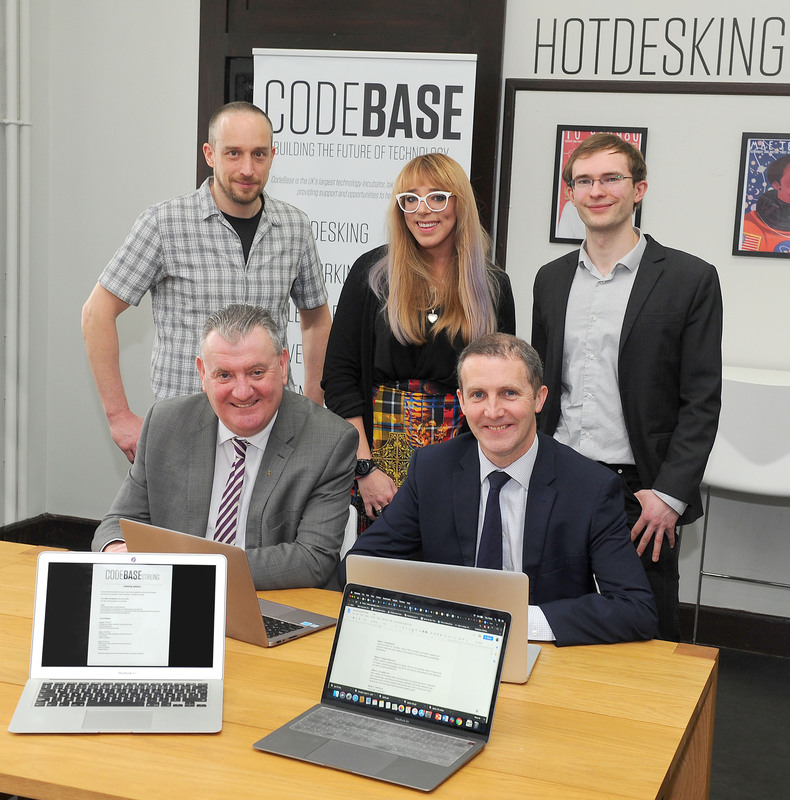 Through Stirling’s already substantial investment, and further funding to be provided by the Stirling and Clackmannanshire City Region Deal, CodeBase has been, and will continue to be critical to the success of the Digital District. The facility - which opened in 2017 - is a digital hub offering hot-desking, co-working and office space along with a flexible events space, all designed to support the aims of the Digital District and to provide a focus for building a strong digital technology cluster and community in Stirling. Infrastructure Secretary Michael Matheson said: “I was delighted to meet with Stirling Council and Codebase today to learn about Stirling’s Digital Hub and how it is helping local digital companies, including start-ups, to grow. It was also fantastic to hear about how Codebase is working with the local community and schools to develop digital skills for individuals as well as responding to the needs of the digital technology sector. Stirling Council Leader, Cllr Scott Farmer said: “The creation of Codebase was in recognition of our ambitions to make Stirling one of the most important centres for Digital Technology in Scotland and to act as a key driver behind the development of Stirling’s Digital District. Over the last two years the Municipal Buildings have undergone a phased refurbishment programme, financed by the Council through the City Region Deal allocation within the Capital Budget. The buildings have been turned into a modern and flexible space, tailored to support the start-up and growth of businesses and to provide a focal point for building the digital tech community in Stirling. Cllr Margaret Brisley, convenor of Stirling Council’s Finance and Economy committee said: “CodeBase has been an excellent asset to Stirling and it is our aim to now increase its importance. 111 business related workshops, seminars and events have been delivered from within Codebase. Tailored events including; Pre-wired (a coding club for under 19s), and Digital Skills for Girls, which explores a range of digital disciplines and is designed to tackle the gender disparity within the digital technology sector have also been met with great success. Front Row - Scott Farmer, Leader of Stirling Council, Michael Matheson MSP - Cabinet Secretary for Transport, Infrastructure and Connectivity Back Row - Will Adams, a tenant of Codebase Stirling, Kelly Gardner, Digital and Events, Codebase Stirling; Adam Alton, Senior Manager at Codebase Stirling.